Happy new year! Even though it’s only been a little over a week into 2018, it’s been a great year so far. So many people are making new resolutions to live a better life in this new year, and I’m no stranger to it. Whether it’s resolving to exercise more, or to completely change up the decor in your home, a change can be nice. One of the changes that I love to make is putting up some of Target’s Hearth and Hand collection decor, made in collaboration with Magnolia. The whole line is full of some of the most wonderful pieces you’ll find, and they’re very affordable. 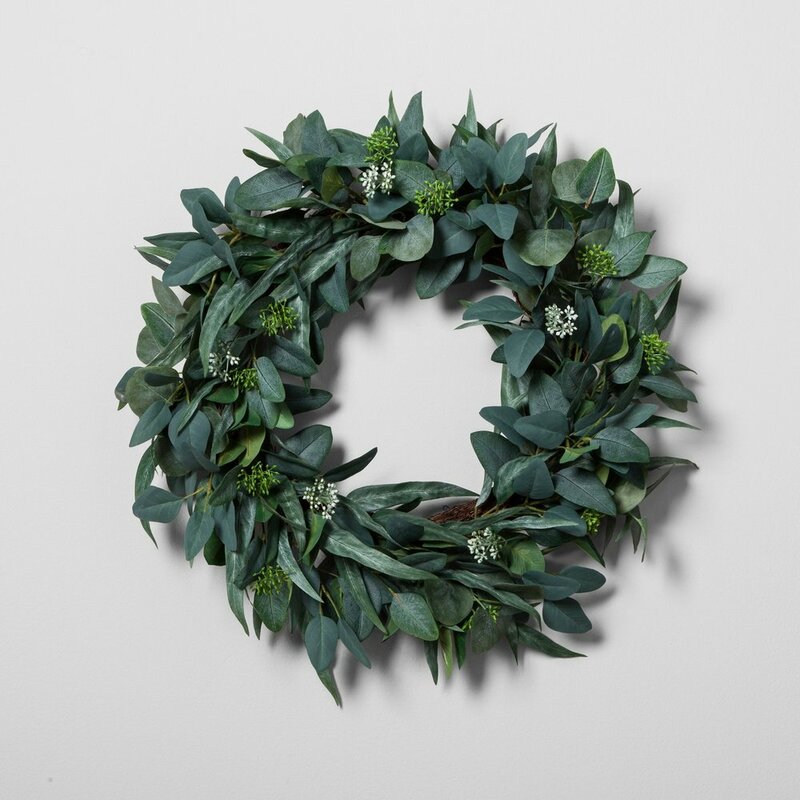 Case in point, this lovely eucalyptus wreath! I love to fit my decor advice into the farmhouse aesthetic, and this wreath would be great for it. Now that we’re nearing the tail end of winter, it’s about time to start thinking about spring decorations, and this wreath is a wonderful transition between the two seasons. Hang it on the front door if your color scheme allows, or hang it indoors to bring a little green in to help liven things up. While it’s winter, it can be tough to get fresh flowers that last. Thankfully, Hearth and Hand has quite the catalog of flower bundles, fillers, and stems that will last well past the first crocuses of spring start to bloom. And these decorations look so nice, you may just want to skip the fresh flowers entirely this year, if you wouldn’t miss the scent so much. 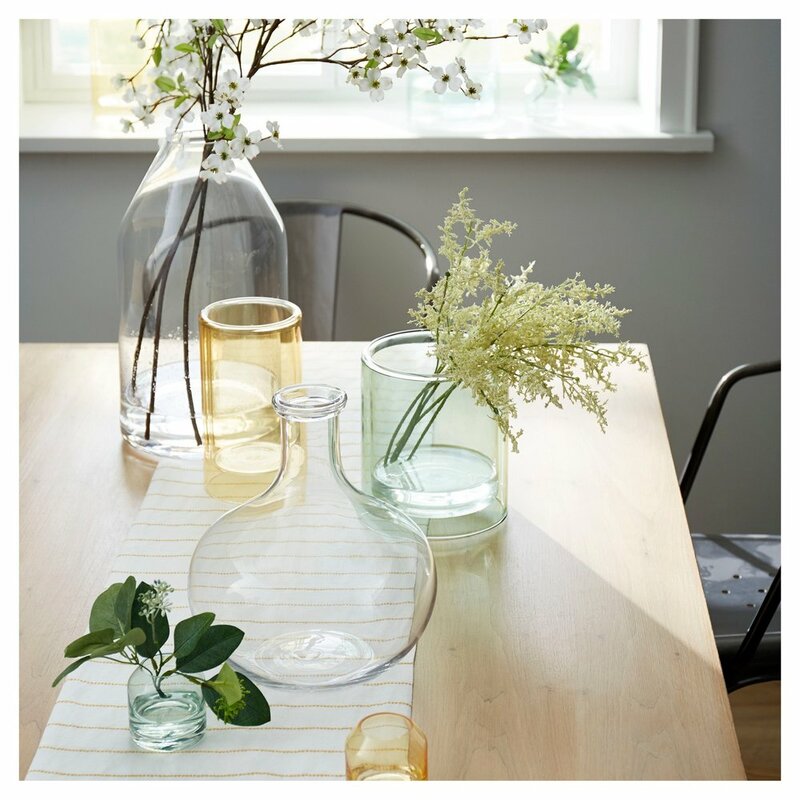 There are astilbe flower bundles in pink and white, eucalyptus stems, or even succulent stems, and vases are easily accessible and easy to order along with any bundles you may choose. One of the things I love most about the farmhouse style is all of the little accessories and trinkets that add to the whole rustic atmosphere. Like this wood and wire tray, any sort of wood accents you can sprinkle in will add a lot to the whole feel of your home. Metal accents like this galvanized storage bin will add more of a country feel to your decor, or a woven poplar basket will help tie the whole room together. Building a themed decor requires that you think about all the little things just as much as the big, and Hearth and Hand makes this easy! Resolutions can be difficult to keep. Anything that helps us along the way is a valuable asset, and if you’re redecorating for spring, then this is one of the best ways to do so. The whole line is huge, and everything I mentioned doesn’t even scratch its surface. There’s no shame in taking the easy route - if you’re wanting a change, this is the best one to make!